Pluchea odorata (L. ) Cass. 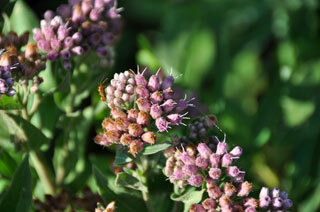 Also Called: Sweet scent, shrubby camphor-weed, purple pluchea. Stems: Erect, nearly glabrous below, glandular and minutely pubescent above. Leaves: Alternate, ovate to lanceolate, 1.6 to 6 inches long, .4 to 2.8 inches wide, somewhat succulent; surfaces glabrous to finely-pubescent; margins shallowly toothed to nearly entire; tip pointed to tapering-pointed; base abruptly or gradually narrowed; stalk sessile or to 1.2 inch long. Inflorescences: Heads purplish-pink, in flat-topped or rounded arrays, these often layered; branches minutely pubescent, ash-colored; lateral branches equaling or exceeding central branches; involucre 1/6 to 1/4 inch tall; involucral bracts overlapping in several series; outer bracts usually pink or purple above, minutely pubescent, glandular-sticky, margins fringed; inner bracts sparsely fine-hairy at tips. Flowers: Ray florets absent; disk florets 6-19, corollas pink or rose-purple. Fruits: Achene, cylindrical, about 1/25 inch long, brownish-black, 4-6-angled, sparsely glandular-hairy or bristly, tipped by single series of barbed, hair-like bristles untied at base, enclosing small seed. Habitat: Saline or brackish marshes, stream banks, low drainage areas. Comments: Marsh-fleabane is very aromatic.